Proton Cars has highlighted its range of Motability deals* available to customers through the Motability scheme. Available with nil deposit under the Motability scheme, Proton’s stylish and affordable range of cars are fitted with parking sensors as standard. Offering motorists a choice of Contract Hire or Hire Purchase schemes, Proton’s dealerships around the UK can provide customers with real peace of mind with all maintenance and servicing, comprehensive insurance and full breakdown assistance for the vehicle, provided by the RAC, being included in the agreement. 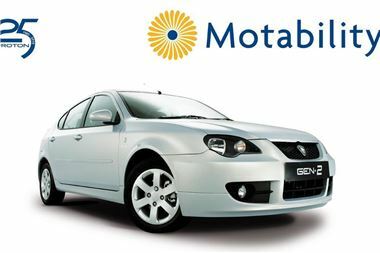 The Motability Contract Hire scheme is available over a three-year period on selected Savvy, Gen-2 (hatchback and saloon) and Satria Neo models. The Motability scheme was set up to enable people claiming the higher rate mobility allowance to have a new car instead of the allowance which enables them to get about much easier. Included in the cost of the surrendered allowance are insurance, road tax and servicing costs – making it a really convenient programme. The scheme, which is a registered charity, has a total fleet of cars in excess of 533,000 across the country, making it one of the largest fleets in the UK. The smart little Savvy comes with a zippy 1.2 litre engine and smooth gearbox making it a lively performer. With contemporary clearform headlights, low front skirt and 15” alloys, the Savvy packs a punch when it comes to style. It also comes with a whole host of other features as standard, including remote central locking, parking sensors and an alarm/immobiliser. Available with the 1.6 litre engine, the GEN-2 range, which includes the 5-door GEN-2 family hatchback, the 4-door GEN-2 saloon and LPG dual fuel GEN-2 ecoLogic, represents great value for money and features air conditioning, electric front windows and reverse parking sensors as standard. Meanwhile, with its Lotus ride and handling, a sporty exterior, the Satria Neo delivers both excitement and economy in one car; plus 16” alloy wheels, electric windows, reverse parking sensors and rear spoiler all as standard and topped off with a centre mounted exhaust and race-inspired bucket seats. To find out more about any of these offers or arrange a test drive, contact your local Proton dealer, call Proton on 0800 0 521521 or visit www.proton.co.uk.